Sometimes it can be hard to find a sport watch that is still sleek and not so mechanical-looking. Women especially still want to wear a piece that is attractive and doesn’t look like it was assembled with plastic in five minutes. Thankfully, grandeur and function come into play with the Cartier Must 21 Black Rubber Watch W10198U2. When searching this watch on Google, the first few options that come up label it as being for women, but others further down say men or unisex. The very small variance in the size of the case in diameter is the only real difference, and the general appearance stays the same. The straps are unique in that the middle links are made of stainless steel and the two outer sets of links are made of black rubber. Rubber is great for a sports watch to keep it in place and not worry about it sliding up and down on your wrist. Black rubber is also found on the crown, and the case and stationary bezel, with Roman numeral hour markers etched in, are stainless steel. Two rhodium steel white minute and hour hands sweep across a black dial. As this is a chronograph watch, there are three separate sub-dials in addition to the main analog clock. On the inside there is a clear dial with minute marks and written numbers at every 5 minute interval. At 4 o’clock there is the added bonus of a date calendar. Customers who bought this watch had mixed reviews. While some described it as mid-sized, others complained that it was too small and instead opted for the larger model that is designed for men. Those satisfied with the watch found it to be a terrific sports watch because of its simple adjustable straps and the overall form – you can tell it is meant for a person with an active lifestyle just by looking at it. 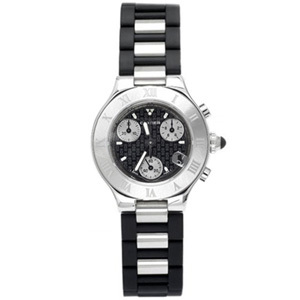 On Amazon.com the Ladies watch sells for $3,330.00. Watchesbydesign.com asks for $3,530.00 for the men’s version, and wristclocks.com calls it a unisex watch for $3,295.00. Unless the gender that the site calls the watch is of any importance to you, the cheapest price is the way to go since they are each the same.